The Healing Brush is an intelligent paint brush that is similar to the Clone Stamp tool only in terms that you sample from one image area by option (Mac)/alt (PC) clicking on a source area and then paint to cover up blemishes, wrinkles, scratches, or image damage. When the Healing Brush samples it "looks" at the texture, color, and luminosity of the source area separately. Then when you paint it merges the texture from the sample area into the color and luminosity of the destination area. To create a seamless merge i.e. 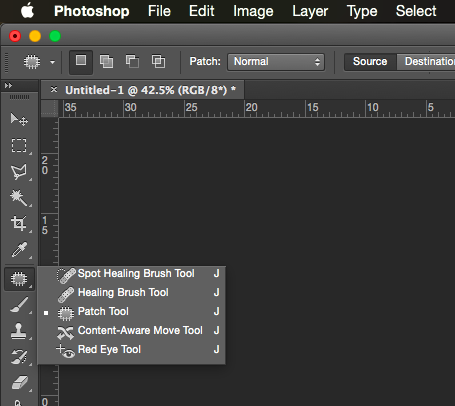 retouch the Healing Brush spreads out by10-12 pixels around the brush. This is an important tidbit of information to keep in mind when using the Healing Brush. Due to this built-in spread it is recommended to use a hard-edged brush when using the Healing Brush.